- Metamorphoses has been extended at Lookingglass through December 16; the show has gotten a bevy of rave reviews. 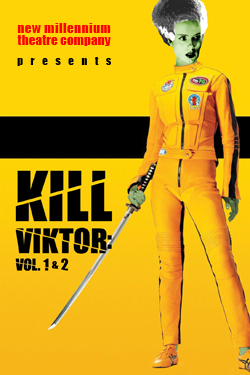 - Halloween shows to look for: New Millennium Theatre&apos;s Kill Viktor: Vol. 1&2 at Theater Wit, Death Toll: A Drinking Game Performance and Nightmares on Lincoln Ave IV: Welcome to the Undead City at Cornservatory, Birth of Evil and Troll the Sequel, Troll Again! from Chemically Imbalanced Comedy, Zombie Genius at the Annoyance and 500 Clown Frankenstein at the Viaduct, just to name a few. - Speaking of the Annoyance, they&apos;re doing a staged reading of Lysistrata on November 5 to raise money for women&apos;s health. This production will be directed by Anne Libera, who is Director of Comedy Studies at The Second City Training Center. - Al Pacino told the Sun-Times that he would love to perform in Chicago at the Goodman, Steppenwolf or for "“anyone who would have me.” He was here Thursday promoting his movie Stand-Up Guys, which opened at the Harris Theater. Alan Arkin was also there; he too sang the praises of our fair city.